Family-friendly dance routines were developed in collaboration with an Emmy-recognized children?s dance choreographer! Get ready to move and groove as you dance along with Dora, Diego, The Backyardigans, and The Fresh Beat Band in Nickelodeon Dance. Gamers big and small will stay active by twisting, tapping, shimmying and shaking to classic hits and Nickelodeon favorites like “We Did It,” “Al Rescate,” “Yeti Stomp,” and “Here We Go”! Nickelodeon Dance is a Dance Party game developed for young players on the Wii gaming platform that blends the fun and great exercise of dancing with TV’s popular Nickelodeon characters that kids love. 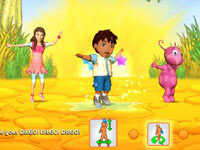 Characters children can expect to dance with include: Dora from “Dora the Explorer,” Diego from “Go Diego Go”, the band members from “Fresh Beat Band” – Marina, Kiki, Twist and Shout, and others. The game contains 30 songs, fun easy-to-master choreography, 2-player co-op support and fun but effective workout functionality aimed at kids. Nickelodeon Dance is a whole new kind of Nickelodeon play experience allowing kids to dance along with Dora, Diego and the Fresh Beat Band for the first time. Gamers big and small will get up off the couch, grab a Wii Remote and twist, shimmy and shake to 30 songs sung by Nickelodeon friends including theme songs and Nickelodeon hits like “We Did It,” “Al Rescate,” and “Here We Go.” In addition, popular favorites like “Dancing In the Street,” “We got the Beat” and “Rhythm is Gonna Get You” ensure fun for the entire family. 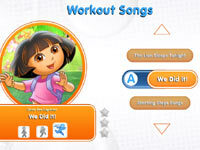 Parents focused on increasing their child’s physical activity will appreciate the workout feature which promotes heart healthy activity as kids ratchet up the dance action and are graded for their accuracy as they dance with the Nickelodeon gang. And since nobody wants to dance alone, Nickelodeon Dance supports two players on every song, with easy-to-follow visual oriented dance move prompts posted at the bottom of the screen along with song lyrics. Miss Lori and The CAMPUS Kids dance in AWESOME 8 healthy music video!